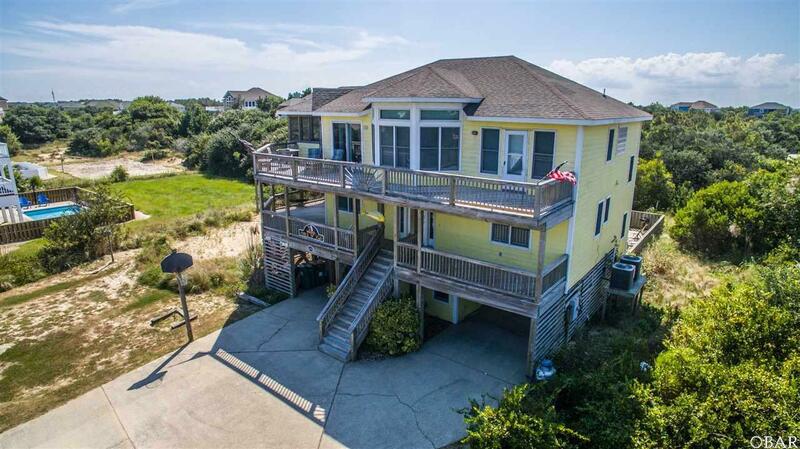 Take advantage of ocean views in this oceanside 5 bedroom, 5.5 bath home in Whalehead! Steps to beach access, a quick walk or bike ride to shopping and dining. Gleaming hardwood floors welcome you into the open kitchen and living area with ocean views. Enjoy dining al fresco on the ocean-facing decks or on the screened porch. Private pool, hot tub, game room, horseshoe pit, and volleyball area will ensure that no matter your beach style, you'll be at home here! Listing courtesy of Darcey Renfrow of Coldwell Banker Seaside Realty.